If you’re not a chemist, the news that Laurier chemists have developed highly efficient catalysts for converting esters into alcohols may seem ho-hum. But consider this: the catalysts pretty much eliminate chemical waste for a process regularly used in both industry and research. An ester is a chemical name for a large family of compounds. The reaction that turns an ester into an alcohol can be used in a variety of processes, such as converting vegetable oils into fatty alcohols, which are often components of cosmetics, fragrances and food products. The classical method of reducing an ester to an alcohol is neither convenient nor environmentally benign – it requires a highly flammable ether solvent and produces large quantities of byproduct that must be separated from the desired product. Overall, the process is dangerous and costly, and most of the chemical waste is not recyclable, says chemistry professor Dmitri Goussev (also spelled Dmitry Gusev). Goussev and former postdoctoral fellow Denis Spasyuk (now an industrial staff scientist at Canadian Light Source) have pursued a different approach. This method uses novel catalysts and hydrogen gas instead of the usual lithium aluminum hydride. No solvent is required with liquid esters. All the hydrogen is consumed and becomes part of the product, so there is no waste byproduct. All the atoms end up in the product. “In green chemistry, this is called a high atom economy,” says Goussev. Goussev and Spasyuk discovered their first hydrogenation catalysts, based on the noble metals ruthenium and osmium, in 2011. The development wasn’t exactly random – it was inspired by published work in the field – but even they were surprised at how well the new catalysts worked for the reduction of esters. 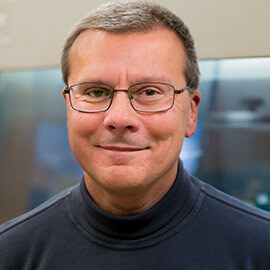 Goussev and Spasyuk teamed up with Laurier’s Office of Research Services and GreenCentre Canada, a not-for-profit organization that helps researchers commercialize green chemistry discoveries, to patent and license their work on ester hydrogenation. Recently, GreenCentre Canada licensed the catalysts to Johnson Matthey, a leading multinational producer of catalysts and specialty chemicals. Ester hydrogenation is used to “manufacture a wide variety of commercial products including pharmaceuticals, detergents, cosmetics, flavours and fragrances,” according to a GreenCentre Canada news release. Goussev, however, isn’t content to sit on his laurels. He’s working on making a new catalyst that’s even more efficient.